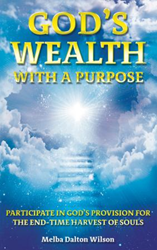 Within the pages of Melba Dalton Wilson’s new book, God’s Wealth With A Purpose, ($11.49, paperback, 9781498492133; $5.99, e-book, 9781498492140) readers will discover how to participate in the transfer of wealth to God’s people. Through Scripture, Wilson encourages Christians to believe, receive, and understand the Word of God literally to find His plan for their lives. Melba Dalton Wilson is a graduate of Agape School of World Evangelism and Missions School and the Arkansas Institute of Holy Land Studies. She acts as president and founder of Acts Ministries, an international missions ministry. This is her debut book. Xulon Press, a division of Salem Media Group, is the world’s largest Christian self-publisher, with more than 12,000 titles published to date. Retailers may order God’s Wealth With A Purpose through Ingram Book Company and/or Spring Arbor Book Distributors. The book is available online through xulonpress.com/bookstore, amazon.com, and barnesandnoble.com.